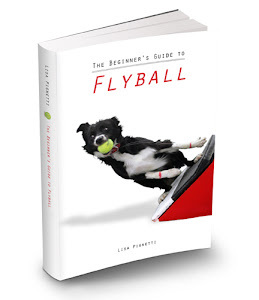 Flyball Prop-a-Ganda flyball blog: How many dogs is too many dogs? When I started dating Todd in March of 2011, I had 10 dogs. Over the past ten years, I had traveled to Texas, Florida, Virginia, South Carolina, Ontario, Michigan and New York to get puppies for flyball. I had spent thousands of dollars. Each puppy was going to be The Next Great Thing. At one point I was trying to train three or four young dogs (under the age of two) at the same time, and I hadn't been on a team that practiced regularly or played competitively for several years, so I was essentially training these dogs alone, at home. My ex-husband and I argued about dogs a lot during our 10-year marriage. He was actually the first one in our relationship to get a dog – when I met him he had a Jack Russell and I had a cat. But one dog led to two, and then those two had a litter of puppies and we kept one, then I discovered flyball and three became four, and so on. My ex-boyfriend (the one who lived with me after the ex-husband) and I argued about dogs, too. He couldn't understand why I needed a "whole F'ing sled dog team" if I could only race/handle one dog at a time during flyball. He didn't like the dogs on the couches, the dust in the house, the barking, or pretty much anything about the dogs, so our days were always numbered, I guess, but the straw that broke the camel's back was when I got my Border Staffy, Glock, without consulting him. (I knew he would say "No," so why on earth would I consult him?) We broke up three days later. Ironically it was Todd, a kindred "crazy dog person", who finally convinced me – mostly by example, but also with reason – that I didn't need any more dogs. And that I would, in fact, be better off with less dogs. 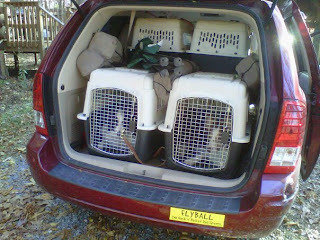 9 or 10 dogs packed up for flyball. No room for kids! I was spreading myself too thin, trying to train and care for all these dogs, and the result that was that nobody was getting trained well (or often) and I was stressed out. And I was practically a prisoner of my own house – it's hard to leave 10 dogs and just traipse off to the beach with the family for the weekend. So I placed several of my dogs into new homes. I know some of you will frown on this, but I think the dogs are happier now than they were with me. They almost certainly get more attention now. My oldest Jack Russell went to live with my ex-husband, who plays frisbee with him every day and lets him sleep in the bed. My youngest Jack Russell, the one with ADHD who chased other dogs incessantly, went to live with a retired gentleman in Myrtle Beach. 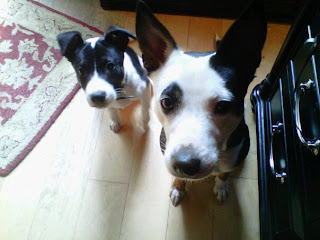 My mean Jack Russell went to live with my pet sitter (who thought she could "fix" her aggression toward other dogs...I wasn't surprised a few months later when she asked if she could place the dog with her boss in a single-dog home). My youngest Border Collie went to play flyball in Maine. My sweet older Border Collie died of cancer this past November. Glock went to live with Todd while he was still a puppy – Todd raised six service dog puppies before he got into dog sports, so I knew he would put a great foundation on Glock. My Border Staffy Fringe flew out to San Diego earlier this year to start frisbee training with Todd. So, now I'm down to three dogs. And it's pretty awesome. They can all fit in my van, unstacked! I can take them to the beach for the weekend. We go on walks through the neighborhood. I play frisbee and chuck-it with them in the front yard. They can all hang out in the house together unsupervised. A bag of food lasts for weeks! They don't restrict my life anymore, and I don't restrict theirs. When I move to San Diego in a couple of weeks the pack will be bigger, but Todd and I will be managing them together so I'm feeling pretty good about it. How many dogs is too many? It depends. Some people, like breeders, trainers, and others who work with dogs every day, may have the space, the setup, and the dedication to manage many dogs. Others may find themselves overwhelmed with three. I guess that's a good place to start – if you're feeling overwhelmed, you probably have too many. If you can't go out of town (unless you're going to a flyball tournament) because you have too many to take with you, or there's no way you can leave them home with your roommate/spouse/partner, or it's too complicated to leave them with a pet sitter, or you can't afford to kennel them, or whatever, you probably have too many. If your dogs are in crates all the time, YOU HAVE TOO MANY. I'm interested to hear what you guys think about this topic. Praise the lord! Less dogs is a dream come true. All THREE of my dogs are getting way more time hanging out, frisbee throwing, trips to the park. I feel as if a 20 dog weight has been lifted from my chest. I like my dogs again! Quality over quantity is the way to be. I think I agree, at the base of it. I know that more than the two dogs I have now would probably be too much for me if I wanted to bring them along for trips to the beach, hikes, etc. Though I have successfully brought along my mom's dog quite a few times with no problems. On the other hand, I know a number of people with quite a few dogs, all of whom get a lot of attention. Each dog has at least one sport they compete in, be it flyball, agility, disc, nose work, rally, obedience, lure coursing, or something else. Each dog gets to do what they are best at and enjoy the most. Interesting timing of this for me as we are about to add dog #7 in the next month or two. It really is a question without a definitive answer because it all depends on you, your situation and your pack. Gotta say though that even though I will literally fall apart when our two oldest go (they are 12 and 13) I am kinda looking forward to a 5 dog pack for several years after they pass. I have 9 dogs right now. Have had up to 11. A lot of how easy it is to manage is due to the dogs in the pack. I have had several dogs who hated each other. Keeping them apart requires shifts at home, putting crates in specific configurations at tournaments, making sure they are not both out walking at the same time, etc. It is a real pain. Although it was sad, I lost one of those dogs this year to cancer. The change in my life with the dogs has been dramatic. It is so much calmer. I can literally have 8 of my 9 out together. We traveled to two tournaments and I only needed two crates in the hotel room; all other dogs could be out together! What a change. 15 years of separating and making sure dogs could not get to each other is very stressful. I am almost to my zen pack --- they could all be out together all the time. I cannot imagine being without any of my dogs and I enjoy having a great big pack around me. It does cause some giving up of other things but to me, it is worth it. I would never want to be without my dogs, big pack or little pack. I am curious. Was reducing your pack a stipulation of moving in with your current beau? Had you not re-homed any dogs, would you still be proceeding with your move? It is all about what works for you and your lifestyle, isn't it. There were a lot of interesting comments about this on Facebook, too (on my personal page - i'm trying to get everything transitioned back over to a FB fan page after FB did away with groups and phased out the Prop-a-Ganda group in the process -- thanks, Facebook!). The dogs i rehomed are all happy. 3 of the 4 dogs are now in single-dog homes getting 100% of the attention, so i really don't feel bad about it. They're happy and i'm happy. Win-win. Lisa, kudos to you for realizing that you weren't able to do it all. There is no shame in knowing you have placed the dogs in homes that are better suited to them. I have 6 dogs and the only way it works is that I have 6 that get along well & due to our sweet home/work situation they are able to get what they need. When I had 4 & one was a problem it was like having 10 dogs! I also value my marriage, each new dog is an agreed upon thing. We both have to deal with the dog, we both will work with it, manage the pack etc. Costs should also play into the decision. Can you afford proper vetting, what if they get sick, need major surgery etc. Old dogs = $$$ & sometimes young ones do too. It's easy to think with your heart & that you can love them all enough, but using your head can keep things sane! !